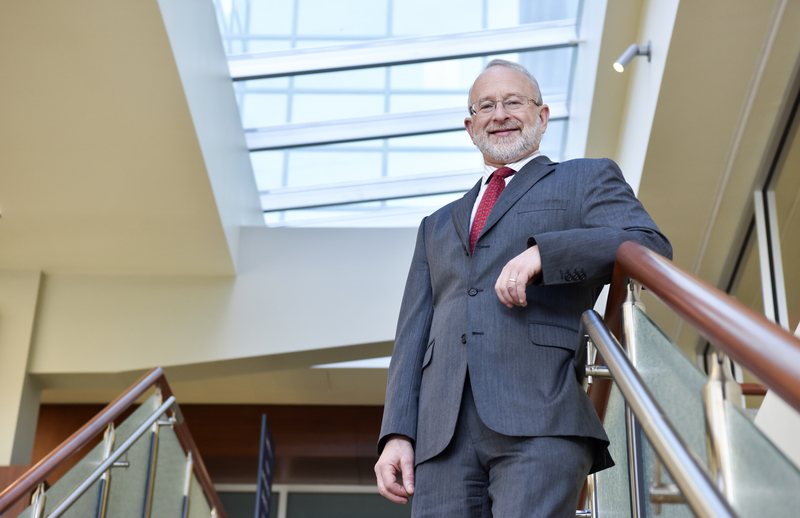 Richard Goldberg, the director of WVU’s Cancer Institute and the Laurence S. and Jean J. DeLynn Chair of Oncology, is researching a new drug combination to treat colorectal cancer. A recent study he conducted with an international team of scientists suggests the combination may halt the cancer’s progression longer than conventional treatments do. Once colorectal cancer invades another organ—the liver or lung, for instance—a cancer patient has about a 13 percent chance of living five more years. Richard Goldberg, who directs the West Virginia University Cancer Institute, is searching for new ways to slow this cancer’s progression. In a recent study, he and an international team of scientists investigated a new drug combination for treating metastatic colorectal cancer in patients who had no—or only temporary—success with conventional chemotherapy treatments. When a first-line chemotherapy regimen fails, a physician may follow up with a second-line treatment to attack the resistant or resurgent tumors. But when it comes to colorectal cancer, these second-line treatments halt the tumors’ growth and spread for just a few months, on average. Goldberg and his colleagues wanted to stop the cancer’s growth for longer than that. They investigated whether combining a typical second-line treatment, called FOLFIRI, with another drug, called Regorafenib, was a safe and effective way to stall the cancer’s progression. Regorafenib had already been approved as a standalone treatment for colorectal cancer, but using it alongside FOLFIRI was novel. For their randomized, double-blind study, Goldberg and his team recruited 181 colorectal cancer patients with tumors that couldn’t be surgically removed, had spread to other parts of the body and had progressed after a first-line chemotherapy treatment. Some of the patients were randomly assigned to receive FOLFIRI—the standardly used second-line treatment—along with Regorafenib. Others were assigned to take FOLFIRI and a placebo pill. Patients who received the new drug combination tended to have a longer interruption of their cancer progression. The median length of their progression-free survival was 6.1 months. Meanwhile, the patients who took a placebo remained progression-free a median of 5.3 months. In addition, patients who took both FOLFIRI and Regorafenib experienced a modest increase in overall survival. The researchers also wanted to see if by using a lower dose of Regorafenib than is recommended when the drug is administered by itself could reduce the side effects patients experienced from the new drug combination while still slowing the cancer’s progression. Instead of prescribing 180 milligrams of Regorafenib, to be taken each day for two weeks, they prescribed a daily dose of 160 milligrams, to be taken for six days. “It actually turned out that it was relatively well tolerated by reducing the dose and duration of the Regorafenib,” said Goldberg, and we still saw an indication of increased efficacy. That’s important because the side effects of Regorafenib, even when it’s used alone, can be nasty. They range from mild nausea and diarrhea, to severe fatigue and hand-foot syndrome, a condition that can make someone’s palms and soles so tender that they have trouble washing dishes; using knives, can openers and gardening tools; or walking.